Clinton Mortley leads Intermountain Livewell to a top 3 sweep in the 2013 Lotoja Classic men's pro/1/2 field. Photo courtesy Ricky Bangerter. While riding in the dark to the start of this year’s 31st Annual LoToJa Classic, Clint Mortley suffered an unexpected and dispiriting setback. He broke his cherished Ralph Lauren Polo sunglasses and didn’t have a spare. Mortley, 26, a Cat. 1 cyclist who won LoToJa in 2011 and rides for Livewell/Bountiful Bicycle, tried not to think his broken sunglasses was a bad omen, a hint of more misfortune to come. For he could argue that bad luck in last year’s LoToJa ruined his chances of winning the Men’s Pro 1,2 3 category two years in a row. But serendipity sometimes has a way of happening when least expected. Just minutes before his category start, a friend came to the rescue with a pair of loaner sunglasses. They weren’t crap glasses either; they were Oakleys—and something more. Luck or magic, whatever it was, certainly helped his campaign to add another LoToJa victory to his palmarès. Despite two flats that made him chase futilely through Star Valley, Mortley recovered, caught the break, and won in 9:12:38 after beating 16 other riders in a “wild” field sprint to the line. Making the win even sweeter were his teammates, Bryce Olsen and three-time LoToJa winner Cameron Hoffman, taking second and third, respectively, less than a second behind. For Melinda MacFarlane (Harristone/Sun Valley Mortgage) this year’s LoToJa was not only sweet, but outright momentous. The 31-year-old mother of two “shocked” herself by winning the Women’s 1, 2, 3 race in 9:35:00 after beating Brooke Parent and Shirley Leydsman (Red Rock HSB) in a sprint finish. The three had ridden an efficient pace line together for over 100 miles. Kemille Garvin on point in the women's race in Cache Valley. Photo by Kevin Jenson. What makes MacFarlane’s win so phenomenal is 2013 was her first year of racing. She only started to ride a bike two years ago—and just for fun with friends. But MacFarlane must have sensed she had tapped into some hidden cycling genetics after winning LoToJa’s Citizen Women 25-35 category last year. Her time was an impressive 10:16:41. The second place finisher came in 25 minutes behind her. And just to think, MacFarlane nearly sold her bike in 2011 because she was tired of embarrassing herself. Despite her best efforts, she often fell. The reason? “I have terrible bike handling skills,” she said. Also phenomenal at this year’s LoToJa was the warm morning sendoff in the upper 50s as more than 1,500 cyclists left Sunrise Cyclery in Logan on Sept. 7 and headed north for the finish at Jackson Hole Mountain Resort. This year’s race featured two big changes over previous editions: to reduce congestion through Cache Valley, licensed riders took northbound US-91 out of Logan and also detoured to the east around Preston, ID before merging onto SR-34 and rejoining LoToJa’s standard course. This detour lowered the race day’s mileage for licensed categories from 206 to 201. The second change combined LoToJa’s “fun ride” participants and citizen “one-day” racers into a new cyclosportive category. The cyclosportive route had riders and relay riders on the traditional, 206-mile course through central Cache Valley, with the first feed zone at Preston. Licensed riders didn’t get a feed until 56 miles into the race near the summit of Strawberry Canyon. LoToJa’s pre-dawn start is famous for being a chilly affair during the first 30 miles through Cache Valley, but the unexpected warmth convinced Mortley to leave Logan only in his summer kit without arm or leg warmers. As the 34-member Men’s Pro 1, 2, 3 field made its way north to Preston, Mortley said he was “content” to sit in and see what developed. “It was a high tempo, and a few tried to get off the front,” he said. But nothing stuck, until Joseph Petrowski (Primal Racing) took a flyer shortly after Franklin, ID and the field let him go. Shortly after turning right onto 2400 East southeast of Preston, Robert Hoene of Bob’s Cycles eased off the front. While eating a Clif Bar, Mortley followed Hoene’s wheel. A minute or two later, Mortley turned around and saw that the field had let the two get a gap. As the gap grew, Mortley and Hoene increased their pace. Together, they merged onto SR-34 northeast of Preston and descended to the Bear River. Shortly after turning right onto SR-36 and pedaling toward Strawberry Summit, they caught Petrowski. The trio rolled over 7,424 foot-high Strawberry Summit with six minutes on the field and began the descent to Ovid and to the next feed zone at Montpelier. After that, they continued tempo up Montpelier Canyon to 6,923 foot-high Geneva Summit, LoToJa’s second major climb. Larry Peterson (69 years old) leading group of several cyclists up the Salt River Pass climb. Photo by Cary Peterson. He, Petrowski and Hoene stayed together climbing 7,630 foot-high Salt River Pass with Mortley taking the King of the Mountain prize. After cresting the summit, they descended quickly into Star Valley, hoping to maintain a large gap on the field. “ I was feeling great, like a million bucks,” said Mortley. “It didn’t feel like I had just ridden 120 miles.” At that point, the trio had nine minutes on the field. But after the feed in Afton, Mortley’s million dollar feel turned into unwanted pocket change. About a half mile north of town, he suffered a rear puncture and watched Petrowski and Hoene roll away. He waited alone for at least five minutes before a wheel car arrived. After he got a wheel, he began to chase, knowing that five minutes down on Petrowski and Hoene meant he had a lot of work to do. Little did he know his untimely flat was just the start of more unlucky things to come. A few miles after getting the wheel change, he noticed the quick release wasn’t tightened all the way and he feared the rear wheel would begin to move in the dropouts. He stopped to tighten it, and resumed the chase. He figured he had five minutes on the field and was five minutes behind Petrowski and Hoene. He was in no man’s land and knew it, but he got back into the drops and went for it. But only a few minutes after tightening the quick release, he began to feel the rear tire go soft. It was a slow leak, but Mortley knew he had only a few miles before he’d be down on the rim and looking for another wheel change. After the second wheel change and frustrated at his misfortune, he again got into the drops and went as hard as he could without totally turning himself inside out. Olson (Livewell/Bountiful Bicycle), a teammate of Mortley, and Debry (Revolution/Café Rio) made the bridge and the trio began to work together. “I was totally done, but offered to help,” Mortley said. They rode a fast and efficient pace line though the rest of Star Valley and into Alpine Junction. With 46 miles to go, the trio headed toward Hoback Junction. Meanwhile, the field began to chip away at the gap, and just before Hoback Junction, got within 20 seconds of Mortley, Olson and Debry. The gap again began to grow, and the trio rolled over the bridges at Hoback Junction. Seven miles later, they turned left onto South Loop Road. Less than two miles after turning onto South Loop, they caught Petrowski and Hoene. With the Grand Teton visible ahead, the five riders passed the spot where last year Mortley had to stop, dismount and let the break leave him behind. Yet despite debilitating cramps, Mortley was able to get back on his bike and finish in an amazing tenth place. Bad luck had prevented him from sprinting for a second consecutive win in 2012. Although he “cooked” himself while chasing Petrowski and Hoene through Star Valley, and rode a hard, pace line with Olson and Debry since before Alpine Junction, there were no cramps—no bad luck—on South Loop Road for Mortley this year. The five riders rode together through the bike path tunnel and remained free of the chasing peloton as they crossed the Snake River one last time and turned right onto Village Road for the final seven miles to the finish. They felt the 16-rider field breathing down their neck, but weren’t caught until the finish line was virtually in sight. As the sprint began to spin up with 300 meters to go, Mortley locked onto a wheel in front of him. When the sprint for the finish finally exploded, he went as hard as he could. Weird or not, Mortley was elated about winning his second LoToJa in 9:12:38:319 after last year’s disappointment. He was also elated that second and third place were taken by teammates Olsen and Hoffman, who finished in 9:12:38:400 and 9:12:38:448, respectively. Calling LoToJa “a race of attrition,” Mortley said this year’s victory was a true team win, and he would have been just as happy if Olsen or Hoffman had taken the win instead of him. He plans on coming back in 2014 to once again defend his title. When Melinda MacFarlane pulled up to the start line with 60 other Women in the 1, 2, 3 and 4 category that morning, she definitely didn’t feel like LoToJa was hers to win. Although she had raced extensively this season, and won LoToJa’s citizen women’s 25-35 category last year, she was doubtful of her prospects. In fact, she explained that the month before LoToJa, she hadn’t ridden one century in preparation. Her coach initially suggested that she get a century or two in before Sept. 7, but she declined. MacFarlane instead relied on a season of frequent racing to get her through. Plus, she had no intentions of trying to win. Her only goal was to stay with the lead group as long as possible. But sometimes the best made plans take an entirely different direction when out on the road. 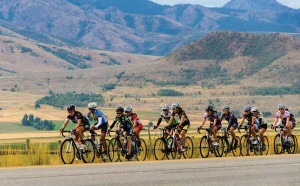 The huge field of women racers stayed together through Cache Valley, around Preston, and during the initial miles while climbing Strawberry Canyon. And MacFarlane wasn’t one of them that got dropped. In fact, she crested Strawberry’s summit in a break with Brooke Parent, Shirley Leydsman (Red Rock HSB), Keri Gibson (DNA Cycling P/B Plan 7) and Kandice Lund (Bountiful Mazda). Together they road a pace line through Ovid and Montpelier, and over Geneva Summit. Just before starting the climb to Salt River Pass, MacFarlane noticed that Gibson and Lund had been dropped. At that point the remaining trio were so far ahead of the field, they didn’t feel pressure to push the pace. After MacFarlane took the Queen of the Mountain prize, the three women began their descent into Star Valley. MacFarlane noted that one of the biggest lessons she learned this year while racing was not to linger at the front of a pace line. The point is to contribute, but also save energy, she said. This is what the three women did through Star Valley, past Hoback Junction and on South Loop Road around Jackson Hole. But after the bike path tunnel with nine miles to go, MacFarlane noticed that Parent and Leydsman began to push the pace harder when rolling to the front of the pace line. “They worked harder to get to the front then I did,” she said. “I wanted to contribute, but I wanted to save energy for the sprint. So it took me longer to get to the front. I didn’t push it.” She noted the estimated gap to the field was 10 minutes at that point. MacFarlane said she couldn’t have picked better personalities to spend the day with, and felt that Parent was the strongest of the three, that she was “going to take it.” Yet, a mile away from the finish, Parent hadn’t dropped MacFarlane and Leydsman. The three women were still rotating a pace line, and MacFarlane was thinking of conserving more energy for the sprint. Leydsman was the first to offer that wheel. When she jumped, MacFarlane was right behind her. But she didn’t stay there for long. Concerned that Parent would come around too quickly, MacFarlane jumped into a full sprint and held it to the line for a first place time of 9:35:00:439. Parent and Leydsman came in behind her at 9:35:01:366 and 9:35:01:868, respectively. MacFarlane said what made this year’s LoToJa win “super exciting” for her was that she took the sprint—“which is not my strength.” She also won her first category 1, 2, 3 race. 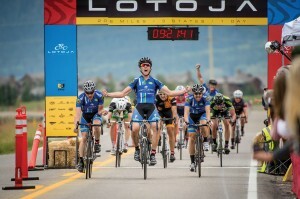 LoToJa Race Director Brent Chambers said this year’s LoToJa was a tremendous success on several levels, the biggest of which was reducing rider and support crew congestion in Utah and Idaho. “Having all licensed categories take Highway 91 and entirely bypass Preston made a huge difference in reducing congestion and improving safety for all of the riders,” he said. Chambers added he’s already excited about organizing next year’s event, which promises to again challenge more than 1,500 riders on one of America’s most scenic cycling courses. “LoToJa continues to be a metaphor for life,” he said. “One of my greatest joys is hearing how LoToJa has changed someone’s life for the better. * The 2013 LoToJa “race route” out of Cache Valley is three miles shorter than in previous years. • The first LoToJa Classic started on an early fall morning in 1983 when seven cyclists took off at dawn and raced northward to Jackson. The winning time was just over nine hours by Logan cyclist, Bob VanSlyke. • In 1982, David Bern and Jeff Keller, two avid cyclists from Logan, Utah, pioneered the LOTOJA bicycle race. They wanted to give cyclists a racing experience that felt like a European road classic such as the Tour of Flanders or Paris-Roubaix. • LoToJa involves over 450 course volunteers — one-third are HAM radio operators providing radio communications and neutral support. • In addition to helping HCF, LoToJa raised several thousand dollars for ASD Connections, National Ability Center, Common Ground Outdoor Adventures, as well as several community organizations and youth groups.